Brief intro: New (first post!) to forum. Only very recently became aware that I live in a Mystery Hominid 'hot spot'. In fact, prior to learning this, I had no idea that such a beast was even a thing in this country. As a flaming skeptic, this information was received with considerable mirth and enjoyment. The fact that there were locals near to me, actively 'hunting' for these mythical beasts was even more entertaining. But then I started to listen to a few of these eye witness accounts, and ... let's just say that I moved from Flaming Skeptic, to Skeptic, then to Agnostic. At this point, I have no idea .. and that's pretty big, for someone like myself. And here's why these accounts made such an impact. I have a background in mental health, and have a pretty good radar for BS. I can extrapolate it via motive/history of subject, and via vocal expression/emotion on presentation. For this reason, I automatically dismiss any and all sightings, footprints, vocal recordings, etc .. when these arrive via Bigfoot 'researchers'. Their desire for the things to exist disqualifies such people fundamentally, but added to the fact that they are wilfully avoiding scientific rigor, we can see that all such findings should be regarded with suspicion. Given the above, I've pretty much written off most of the American material. That 1967 film included (always thought that was an hilariously bad suit). Furthermore, I'm not sure these creatures (assuming they actually exist) are even in that nation .. so depleted and isolated are the ranges they would need to survive. They also wouldn't have sufficient corridors for escape and travel. Even the Appalachian Trail is dotted with towns and interruptions for most of its length. Besides, America does actually have large dark coloured hairy mammals which could be mistaken for a hominid. Which brings us here, to Australia. We DO have the wilderness they'd need, we DO have really good corridors, and we DON'T have any large dark coloured hairy mammals which could be mistaken for a hominid. Further, we have a higher percentage of eyewitness accounts from people who have not previously had the slightest interest or involvement in the subject. That in itself, is quite something. Finally .. the nature of the Australian accounts themselves. I cannot stress enough, how authentic many of them are. By that I mean that most of these people are absolutely telling the truth. There is no way that that many random people, from all ages and socio-economic sectors, can be Oscar-worthy actors. It's frankly crazier to suggest they're lying, than that they're telling the truth. Anyway .. here's where it gets tricky. Just because they are telling the truth, that does not mean that what they saw is what they think it was. Obviously. So where does this leave me? It leaves me asking the obvious question: if (let's assume these critters don't exist) they're not seeing an unknown hominid, what are they seeing? My money would be on pranksters, but I'm curious to know what other 'Agnostics' think. Firstly, have you ever been to the US? I have not but a google earth exploration reveals how immense the habitat is that still exists for these hominids. Much larger than Australia for one simple reason... water. If you take into account, these animals are nocturnal one can see how it is possible for them to not only survive, but thrive. I have gone from sceptic to agnostic, to believer... all from listening to literally thousands of hours of witness reports while driving trucks. Having not had an encounter myself I am still not at the 'knower' level. Thanks for your reply, Wolf. I have had a close look at the States, yes. I probably should have been more specific in my easy dismissal of American sightings. The problem I have with them - purely from an ecology point of view - is that so many of the published videos/pics etc have come from highly unlikely locations. Lakes in Ohio (surrounded by towns and farmland), isolated pockets of forest without corridors, open grasslands, heavily-touristed national parks, etc. I suspect that if they ever existed, their numbers must now be tiny. So much of America has been farmed, just for starters. And again, there is sufficient numbers of large hairy mammals in American forests to account for a good proportion of 'sightings'. Further, it's likely there are more pranksters there, also - given America's longer and more pervasive exposure to the mythology - and of course, their sheer numbers. Ditto those who profit from the industry. Such people automatically exclude themselves from serious consideration. There doesn't seem to be anywhere near as much of that 'industry' stuff here. Meantime, when you were a skeptic, what did you think these Australian witnesses were actually seeing? This is of great interest to me. Especially living where I do, and spending so much time in the bush. As Wolf has said welcome to the forum. May I ask what "hot spot" you are referring to, I only ask as you will find once you start researching these creatures that sightings and encounters with them range in area's, by area's I mean, bushland, farmland, rural, semi rural and even what some might classify as suburbia. Its a world wide phenomenon. Sightings dont happen every day but they do pop up in the weirdest of places. I dont believe that they are all hoaxs either. You will also find after a while that things will not add up in regards to this hominid mystery and that there must be something else going on for this phenomenon to occur. Either you have mass hallucinations on a global scale or there is something more mysterious going on. I'll let you work it out. Thanks for the welcome, Dion! I live adjacent to (as in, a couple of hundred metres from) a wilderness area of forests, mountains, valleys, etc. Some of it unexplored. I spend a fair bit of time in there, and have done for many many years. If you asked me a month ago if I'd ever heard or seen anything unusual, or not readily explained by the usual suspects, I'd have said a firm 'no'. But today I would have to say 'yes', OR .. admit that the addition of new information/ideas has caused me to find links that aren't there. But I'm comfortable with retaining that level of skepticism. I would prefer that anything seen/heard etc is as free from wish-thinking as possible. As regards the world-wide nature of this phenomenon, I would respectfully submit that religions have the same habit of spreading ... despite originating in a single idea or myth, in a single place. These BF stories have been around for a few generations now, and added to the much older indigenous stories in various locations and societies, it provides ample material for anyone with an inclination to add layers. Still hoping to hear from others regarding what these Australian witnesses might be seeing (again, if we assume BF is a myth). Has anyone considered it? Exactly Dion. What surprises me is that people are still in a quandary of do they or don't they exist? The fact that these creatures are able to manifest confusion about their reality tells me there is something purposely occurring that humans can't explain. I've read many reports of amazing encounters with Bigfoot in the US and yet people still can't get their heads around the fact that these creatures exist although in my belief not entirely in flesh and blood. 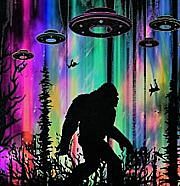 Unlike Bigfoot in the US, Yowies in Australia appear more clandestine there does, however, appear to be far more documented reports of Yowie encounters back in the 18/19 hundreds as Paul McLeod has posted. I believe there could be a strong possibility of Yowie involvement in a number of people that have gone missing and then having their bodies discovered in highly suspicious circumstances once again something Paul has eluded to in his comments, some have gone missing never to be discovered. I think there may be some credence to that idea. Generally, though the public would not accept something that is just too bizarre and horrific to contemplate. I think quandary is probably overstating the matter in my case. I'm more a passive observer, who waits for clarification. Until then, there is nothing to be gained (for me personally) by making assumptions or forcing conclusions. Further, since I do spend so much time in wilderness areas, I don't need the added stress of worrying about 9' hairy hominids lurking behind every large tree. There is more than enough to absorb my attention as it is .. eg, the incredible beauty of the prosaic forest, and all of its known and very real dangers. I don't want to add to that. I should add here, that I have two homes, both in 'hot spots'. One being my primary residence, the other being a weekender which backs directly onto yet another area of wilderness. So you can see I have plenty to think about (especially in fire season!) without inviting more 'forest hazards'. Having said all that, I enjoy listening to witness accounts. I invoke the clinicians ear, and am rarely disappointed by discovering dishonesty. Still hoping to hear from others regarding what these Australian witnesses might be seeing (again, if we assume BF is a myth). * Blackened burned tree stump (Bull Oak is covered in thick, shaggy fibres over 10cm thick in some places, and would possibly lend to that 'shaggy' appearance. * Large Big Red kangaroos can be almost 2m tall, and I have witnessed a massive one at Milmerran hide behind a large eucalypt, and when I tried to flank it by moving sideways to get a better look, the roo moved too, always keeping the tree between us. This guy was taller than me, but I'm only 5' 7" or so. 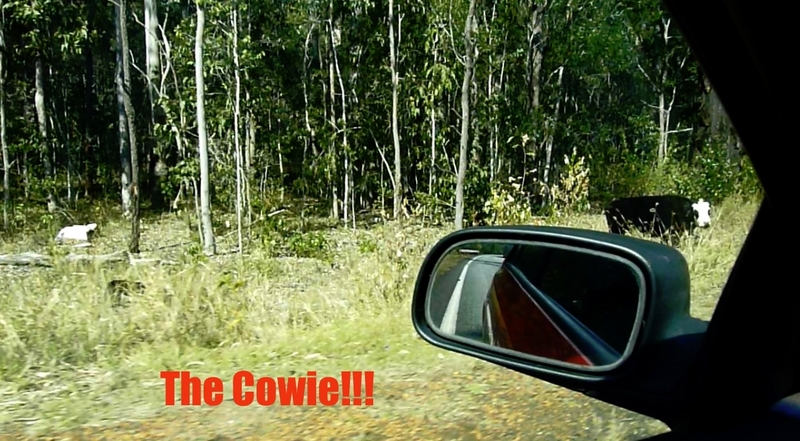 * Cattle or wild horses - they don't always show themselves fully, but I have been so convinced what I saw was a Yowie amongst trees, close to the side of a road as I was driving in a remote area one afternoon, that I had to go back and try to find it again, only to find it was a Cowie*. As in, an escaped young shaggy black beef beast, head down in the scrub, so I could only see it duck down quickly, and lots of black shaggy large body mass. Just my thoughts. And for your entertainment, THE COWIE. when I went back moments later. Man was I disappointed. Well in my opinion, an unrecognised hominid species is the only logical conclusion to all those reports we see. I've had no first hand yowie experiences but I still have little reason to doubt the majority of the reports I read here. What other explanations are there? Perhaps some of the things Shazz mentions are responsible but there are just so many reports that are very clear and definite and couldn’t fit with these explanations. What else is left? Could they be hallucinations, ghosts or spirits, aliens or beings from another dimension? Perhaps others have some other suggestions. All these options seem more far-fetched to me than simply a rarely seen and unrecognised species. This species of orangutan was very shy and rarely seen with only eye-witness accounts and circumstantial evidence to support its existence. It seems that it was not until one was killed that it was officially recognised. So why have we got so little evidence of the yowie apart from eye-witness accounts? After following this forum for a few months, here are a few suggestions. 1. Yowies appear to be largely nocturnal and their habitat is the most remote, dense and inaccessible terrain. We humans like to roam around the plains in the daytime so there is not a good chance to meet a yowie. It would seem that there is really not a lot of completion for resources either. Yowies can find everything they need for survival in the bush and we can find everything we need out of the bush. So there is no reason for the two species to meet. This is probably how they managed to survive for so long with the human species because they do not share territory with us. 2. Where are the yowie bodies and bones? Well I suspect that the yowie is different to all the other animals in the bush. I could imagine that they move around in family groups and it’s likely that they care for their sick and dying and that they bury or somehow dispose of the body after death. Any ancestral yowie remains that are uncovered by the elements in yowie territory are likely to be discovered first by a yowie (not a human) and promptly reburied. It has also been mentioned that remains in the bush will quickly decompose and bones will break down in the acidic soils of a rainforest. This probably play a big part too. 3. Where are the photos? Well there are some photos and video out there but none I have seen of the yowie is very convincing. I think there are three reasons for this. (a) They are nocturnal. You know it’s not easy taking photos in the dark or low light. (b) They are very fast movers. They have probably run away by the time you reach for your camera. And as any photographer will know that a fast moving subject in low light is the most difficult to capture clearly. On top of this, if the yowie has dark skin or hair even less light will be reflected back into your camera. You’d just get a silhouette. (c) In their natural habitat, the bush, there are many trees, grass and undergrowth that get in the way of a good picture and play havoc with the autofocus on your camera. 4. It’s likely that they are sparsely distributed with a family group or individual having a large territory. I’d guess that an individual could cover tens of km in a single night. Having a sparse population will reduce the likelihood of an encounter. 5. Yowies appear to be a generally shy and non-confrontational species. If they see you they will try to remain hidden and perhaps observe from a distance. If pursued, they could very quickly outpace you. They would be impossible to chase down. 6. Scientists and professional researchers do not take the possible existence of the yowie seriously so any evidence gathered is dismissed and is not able to be analysed properly and no library of data can be gathered for analysis and review by others. That’s all my thoughts for now. Hope I’ve got you thnking! Meantime, all of those possibilities are most reasonable, and I can see how those who are actively looking for BF could make those mistakes. This is where my need to make the distinction between 'believers' and everyone else comes in. People who don't think about or know much about Yowie, won't see Yowie when they see a big red roo. It just doesn't occur to them. So when a 'non-believer' sees something they determine must be BF, I'm inclined to take it more seriously. And of course, there are just too many sightings which are not at all 'half hidden'. Very very clear .. out in the open .. daylight sightings. These cannot be explained by Cowies or roos, and it's THESE I'm most interested in hearing theories on. What other explanations are there? Perhaps some of the things Shazz mentions are responsible but there are just so many reports that are very clear and definite and couldn’t fit with these explanations. What else is left? Let's try this scenario: Let's say BF theoretically does not exist .. anywhere. Total myth. On that basis, what are these 'clear as day' witnesses seeing? We know they are not lying, and they are definitely seeing large bipedal hairy simian type 'men'. So what can these be? There really is only one answer, and it's the answer I gave in my first post. Hoaxers. There are enough people out there who do this kind of pranking, to explain many (but not all ... and this is where it gets murky) of these sightings. You see the difficulty I have with jumping to any other conclusions? To me, that is all that 'is left'. Still, there are those cases where hoax wasn't possible - AND the witness was not a believer .. and these, for me, are where it's at. It doesn't leave many, once you whittle it all down, but it's enough. All reasonable points. I would add the following result of a conversation I had last week, on just this topic. I happened to be at a social event with old friends who are all lifelong wilderness types. I'm talking about people who spend every spare minute hiking, camping, climbing, caving, kayaking, mountain biking, etc etc. I asked them the Yowie question - as in, have they ever seen or heard anything which might suggest the thing exists. After a bit of open mouthed vocal paralysis, then gentle mirth, one said "well, the thing is we're not looking". I will add, also, that all three were a little annoyed with my asking. Here's why ... though they're educated and professional people (ie, generally skeptical), they are open minded enough to take the idea on board. I let the genie out of the bottle, is how one put it. They cannot unhear it, and are now compelled to factor in the possibility of 9' hairy hominids, every time they set foot in their beloved Aussie bush. Anyway, just wanted to mention that unwittingly important insight: "the thing is, we're not looking". Explains a lot, if BF exists.